Sonates - Wolfgang Amadeus Mozart - Mediální ohlasy - ArcoDiva management - Hudební agentura - Hudební agentura ARCO DIVA Management s.r.o. 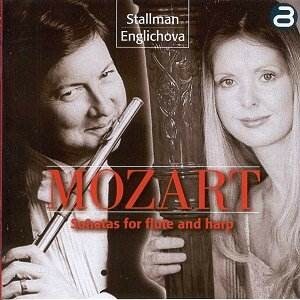 These sonatas are rarely performed or recorded by violin and piano although there was a recording for oboe(!) and piano. This is probably the first performance ever for flute and harp. Arrangement of these sonatas was not necessary, as the flute can play from violin music and the harp can play harpsichord music note for note. Although Mozart later in his life disdained the flute, it is difficult to take him too seriously on this point because his writing for flute is so affectionately idiomatic, as in these sonatas. One does not hear these works, here played on the flute, as necessarily intended for any other instrument.